Our next destination for the day was Udaygiri caves located near the city of Vidisha. A fifteen minute drive from Sanchi brought us to the caves of Udaygiri, one of the earliest Hindu cave temples in India, which are the finest example of Gupta art. Udaygiri caves were created between 4th and 5th Centuries AD by Chandragupta Vikramaditya after defeating the Shaks. This cave temple complex consists of twenty caves, of which two are dedicated to Jainism and the others to Hinduism. 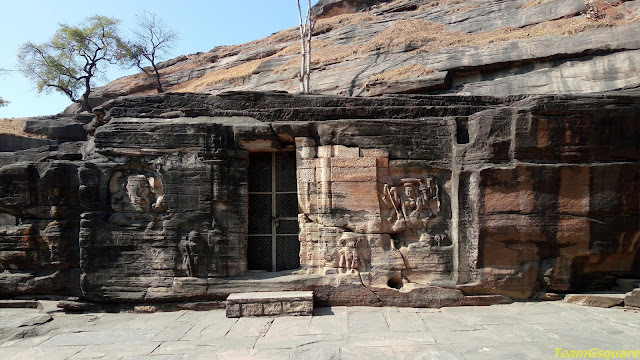 The proximity of the two sites of Sanchi and Udaygiri is proof to the peaceful coexistence of the three religions; Buddhism, Jainism and Hinduism, similar to other sites such as Ellora and Badami. 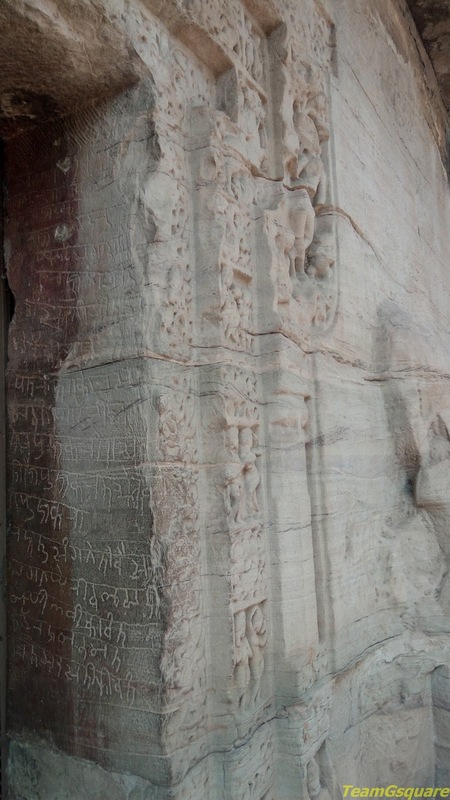 There are many inscriptions found here that date from 401 AD to 1034 AD in various languages. We missed visiting Cave No.1 as it was located far away from the cluster of other caves. Cave No.2 - This cave was empty. Cave No.3 - This cave is also known as Kumara Cave which consists of a beautiful image of Lord Kartikeyan, the god of war. 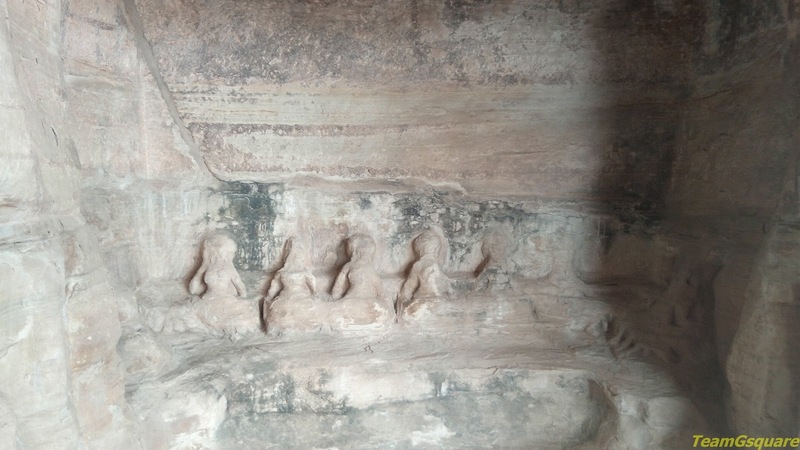 Cave No.4 - This cave is also known as Veena Cave, named so due to the presence of a carving depicting two seated Veena players on its lintel. 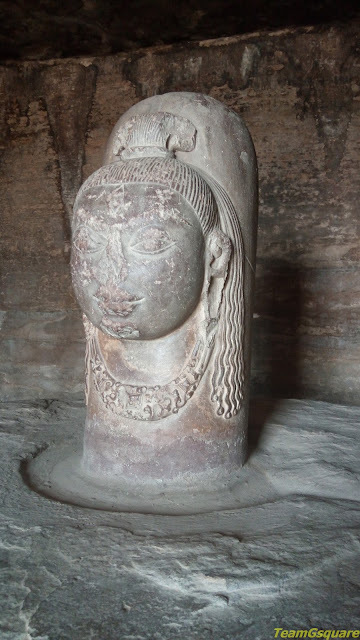 This cave also houses a very beautiful and rare idol of Ekamukhalinga (linga with one face) of Lord Shiva. 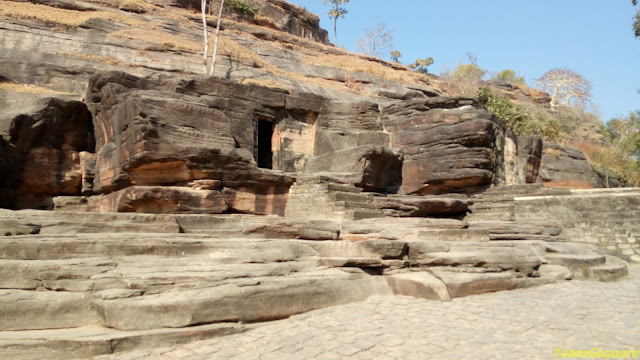 Cave No.5 - This cave is also known as Varaha Cave and contains one of the important sculptures of Udaygiri. 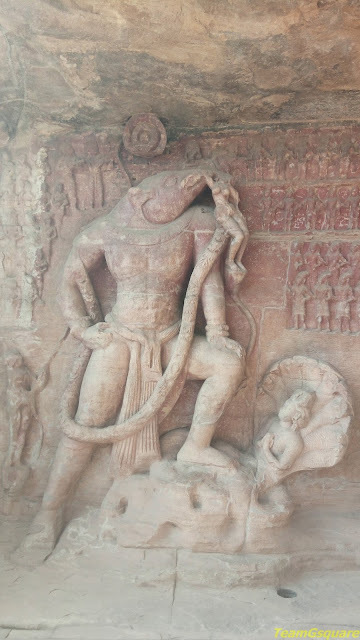 A huge carving of Varaha (third incarnation of Lord Vishnu) is seen here, depicting the story of rescue of earth from the demon Hiranyaksha. The images of the three river goddesses of Ganga, Yamuna and Saraswathi are also carved here which is widely accepted to be one of the earliest depictions of them. Cave No.6 - This cave is also known as Sanakanika Cave. 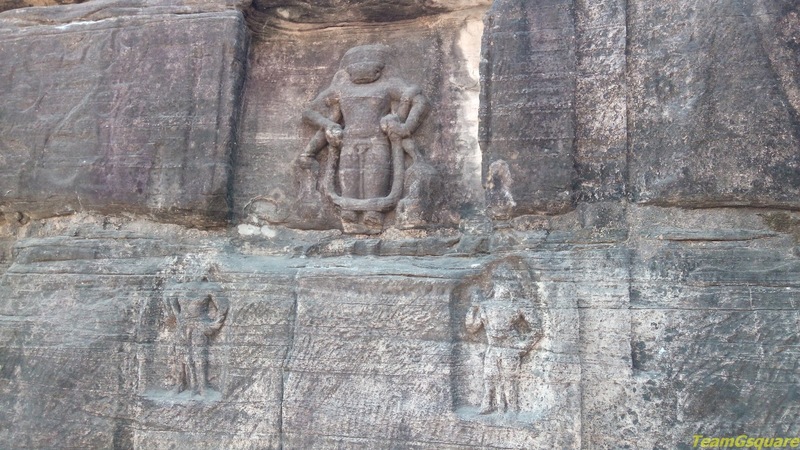 Carvings of Lord Ganesha is seen on the left panel along with the dwarapala. 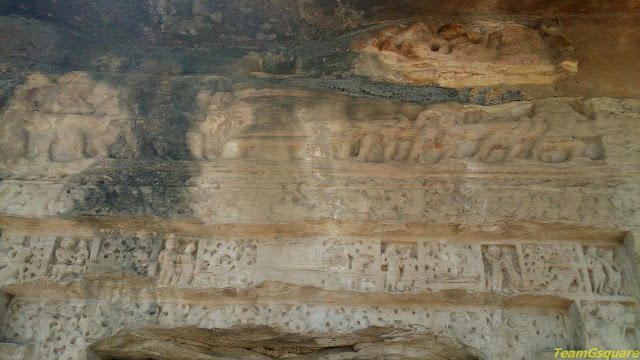 On the right panel of the cave are seen sculptures of Lord Narasimha and Goddess Mahishasura Mardhini along with the Saptamathrikas. The two dwarapalas are also beautifully depicted . 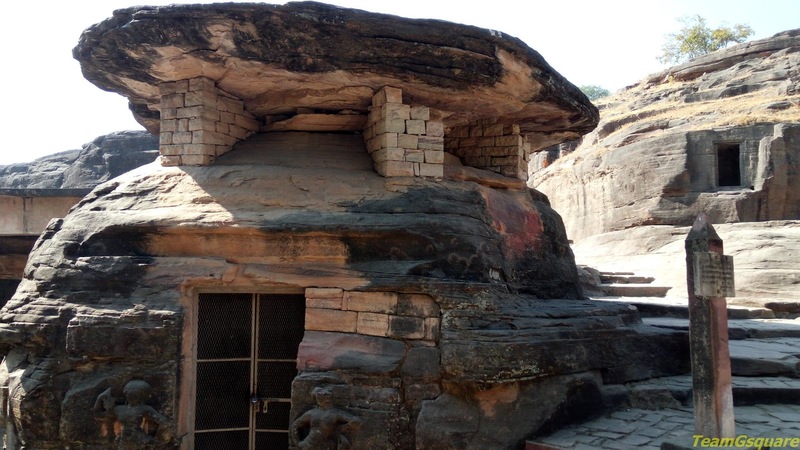 Cave No.7 - This cave is also know as Tawa Cave due to the flattened shape of its roof. The cave is devoid of any images except for a few inscriptions belonging to the Chandragupta era. Cave Nos.8 and 9 are empty. 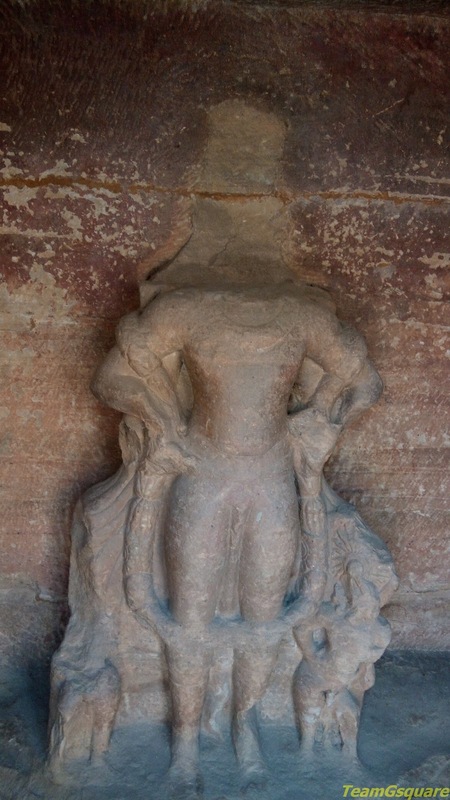 Cave No.10 - This cave contains a damaged idol resembling some form of Vishnu. 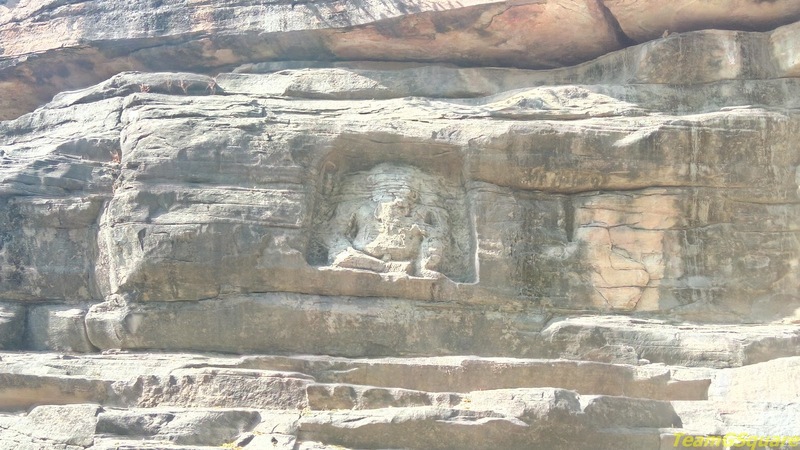 Cave No.11 - This cave is also known as Vamana Cave and contains carvings representing the story of Vishnu's fifth incarnation of Vamana. Cave No.12 - This cave is also known as Narasimha Cave and houses a carving of the Lord Narasimha with two dwarapalas on its rock face. Cave No.13 - This cave is also known as Sheshashayi cave as it houses a long and beautiful carving depicting Sheshashayi, one of the forms of Lord Vishnu, where he is seen reclining on the serpent with a lotus emerging from his navel and Lord Brahma seated on the lotus. 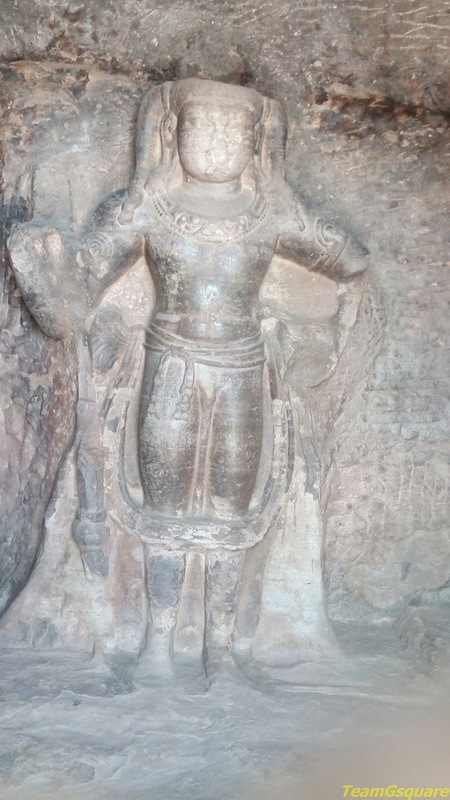 An image probably of Chandragupta II, showing his devotion to Lord Vishnu is also carved. 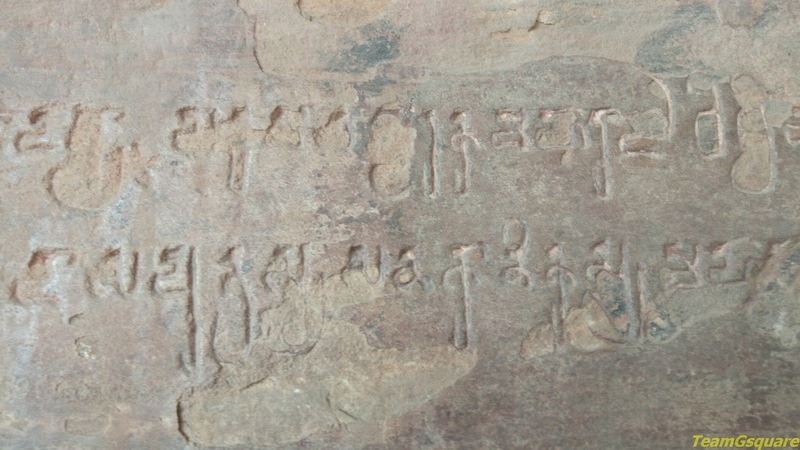 Cave Nos.14,15,16 and 17 are mostly empty with only a few inscriptions. 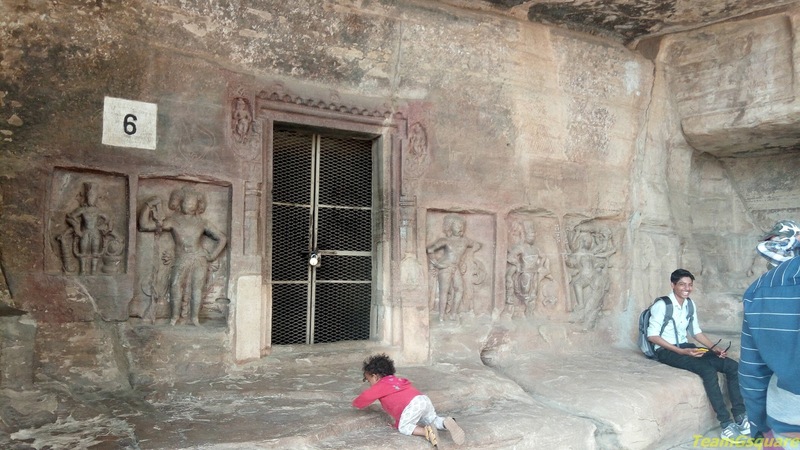 Cave No.18 - The walls of this cave contain carvings of images of Lord Ganesha on the left panel and Mahishasura Mardini (slaying of the buffalo demon Mahishasura by Goddess Durga) on the right panel. Cave Nos.2 to 18 are situated in a cluster. Cave No. 19 - This cave is also known as Amrita Cave owing to the depiction of Samudra Manthana, the great event of churning of the ocean of milk to obtain the nectar of immortality, on the lintel of its entrance. This cave is very big and spacious, with many inscriptions and is situated about 500 m from the cave cluster. It also had a mukhamantapa with four pillars which sadly lies in ruins today. Cave No. 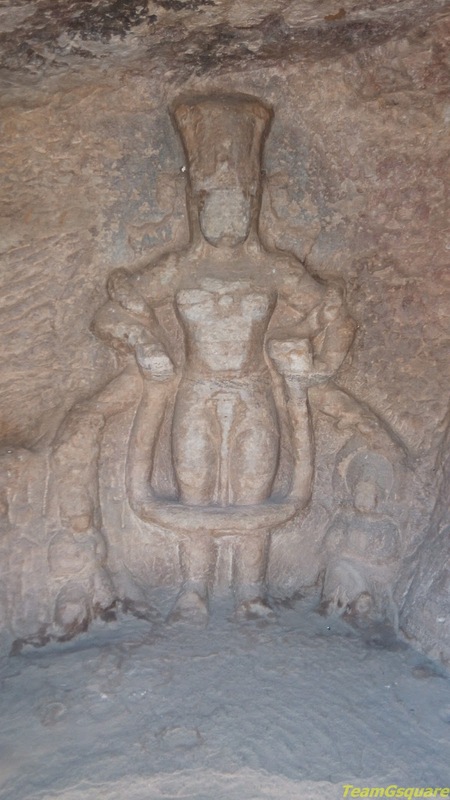 20 - This cave is also known as the Jain Cave and supposedly houses a beautiful idol of Jaina along with other carvings. The entrance to this cave remained closed due to some interior structural damage. One must climb a steep flight of steps in order to reach this cave. Entrance fee: Entry is free. Distance from nearby major town: 57 km from Bhopal and 5 km from Vidisha. 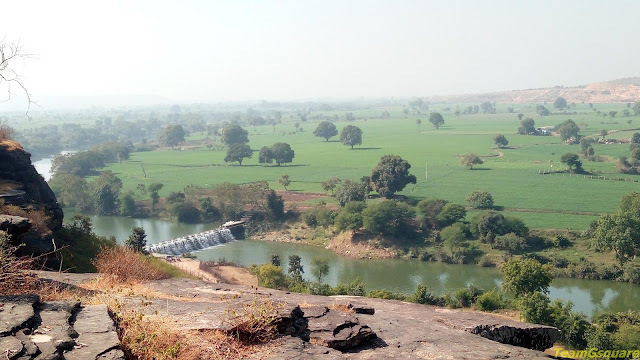 Accommodation: The only option here for accommodation is the Jungle resort maintained by MPSTDC, though one can stay overnight at Bhopal and reach Udaygiri the next morning. Where to eat: Stop by at the Jungle resort for food, alternatively one can travel to Vidisha for better options. 1. Information boards put up by Madhya Pradesh Tourism. 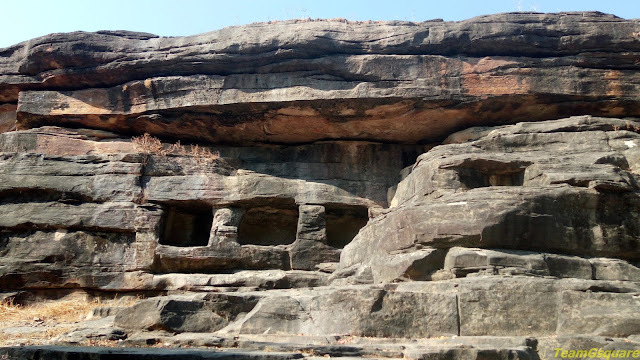 Glad to know in detail about Udayagiri caves. What a beautiful place !!!!! These types of architectural works always make me surprised. Imagine, from 1st century AD and what beautiful craft is here. Can we create something from our generation that 2000 years later generations (if we don't kill ourselves by that time) can be awe struck at? Very extensive coverage of Udaygiri caves. River Halali Viewed From Cave No. 20 is beautiful. MP is an interesting destination and so many places to see though it is no much in popular like other states.